PG Dip Couns Ch & YP. Short and medium-term counselling for individuals and couples. Hello, Welcome to Dragonfly Counselling. My name is ﻿﻿Trisha Packer,﻿ ﻿and the aim of this website is to tell you a bit about me and what I can offer you, in order to help you decide if this is what you need for yourself at this time. Many people seek counselling to help them get through difficult times, or deal with unwelcome emotions. It is not a sign of weakness to seek help, but of strength, as choosing to face up to life's difficulties can be a challenge in itself, and having the support of a counsellor - someone who can accompany you on your journey, without telling you which way you should go - can enable you to find the answers which will work best for you. 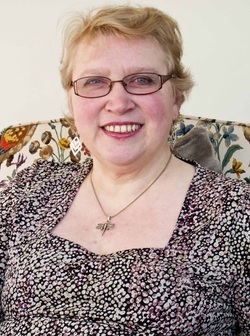 I operate from a dedicated comfortable counselling room on the first floor of my home in Dalton-in-Furness, although if it is not possible for you to see me there, we can arrange sessions over the phone or using Skype. I hope you will find the information in this website of interest, and if you should require any further information after reading this, or if you want to arrange an appointment, please contact me (details below), alternatively you may use the contact form. Next Page: What is Counselling?